Woodland Waters is a deed-restricted community located in Hernando County. Surrounded by gently sloping hills and towering oaks and pines. The naturally serene surroundings, well-manicured lawns and stunning custom homes situated on generous property sizes; ranging from a half acre to six acres. This community offers a relaxing lifestyle, with its mellow atmosphere and picturesque environment. Here, residents get to enjoy a very high quality of life in a family-friendly environment with tree-lined streets, a quiet country setting, and gorgeous surroundings. With its location minutes away from shopping, attractions and the Gulf of Mexico; Woodland Waters is an excellent choice, whether you’re a nature lover or just someone searching for a relaxing place to call home. Woodland Waters has an impressive selection of meticulously maintained properties with stylish interiors is available for anyone looking for the perfect home. 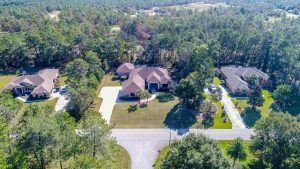 Many of these executive style homes are situated on small lakes or partially wooded areas; some with three car garages and detached garages for storage of Florida toys like RV’s, boats, etc. The Enclave of Woodland Waters is the privately gated section, that consists of 50 custom estates. All residents have access to the community lake, fishing dock, picnic tables and tennis courts. Families with school-aged children have raved about the state-of-the-art Weeki Wachee K-8 and Weeki Wachee High Schools which are located north of this community. The 538-acre Weeki Wachee Springs State Park is located a few minutes away. Here, visitors can catch a mermaid show, take a relaxing riverboat cruise, or navigate the waters of the Weeki Wachee River on a canoe or kayak. Started in 1947, the park’s famous mermaid shows can be witnessed every day at the Mermaid Theater. Shows usually start at 11 a.m. and 3 p.m.
Weeki Wachee is also home to Buccaneer Bay, which features a picturesque white sand beach, exciting flume rides, beach volleyball courts, and more!